Note: This is a reader submission of a new bike he bought. It’s great when someone finds gear that works for them. We love to pass it on! 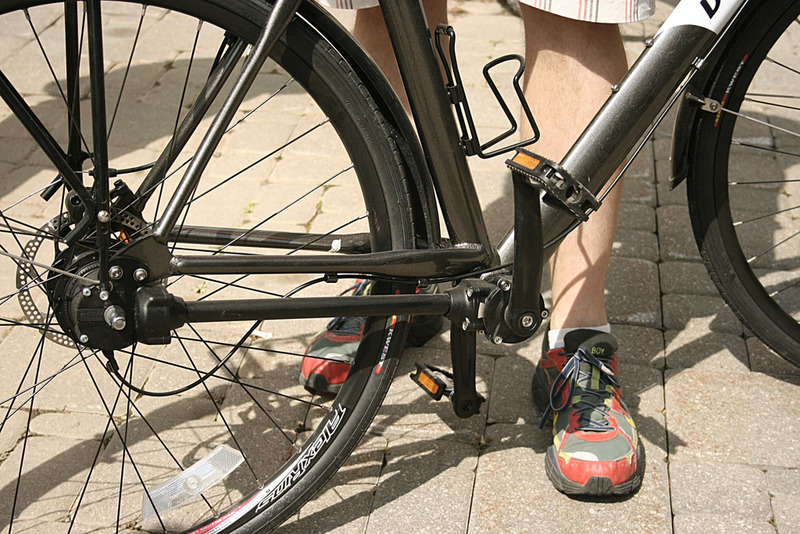 This bike uses a shaft drive rather than chain to couple power to the back wheel. No really, I just bought a bike that has no chain or derailleur. I was in search of a bike to help me with the winter commute to work, after a few years I have experienced enough to realize derailleur systems become useless in the dead of winter. During my search I was directed by a co-worker (after she over heard me whining about my frozen gears) to a site that features chain-less bikes. I took a look and was interested but not sold, I continued to research, reading testimonials and forums. After reading the bike specs, I was interested in this chainless bike design. 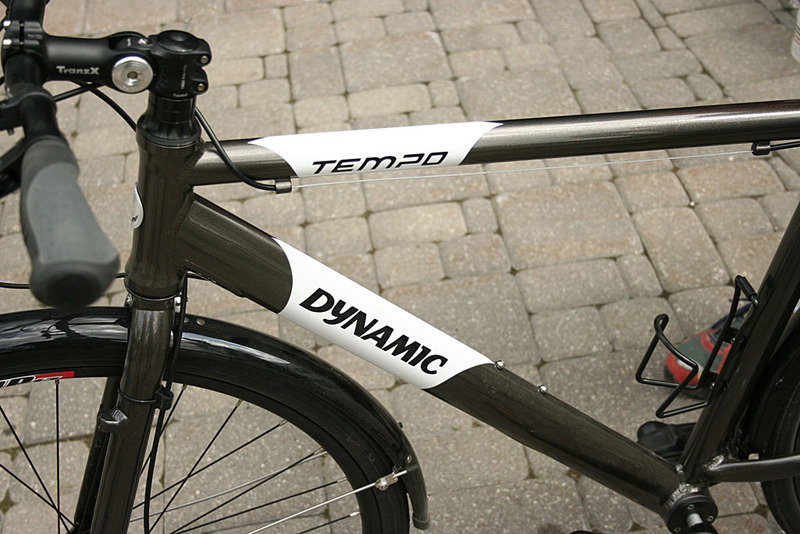 The company is Dynamic Bicycles, find them on the web at http://www.dynamicbicycles.com/. Check them out, now back to my purchase. I called Dynamic Bicycles to explain what I needed in a bike regarding the biking conditions and what bikes on their website I thought suited me. The customer service was amazing, they listened to me and offered some suggestions based on their experience. I got off the phone feeling more confident that this was a good path. The next few weeks we traded emails and called each other, in the end I decided to go with their knowledgeable advice. The bike took a while to be delivered but I wasn’t in a rush being spring/summer; this bike is going to be my winter bike. I ordered a 22″ frame Tempo Cross with disk brakes, 8 speed hub, fenders and rear carrier. Shipping to Canada was little expensive but no hassle so well worth the money in my book. On this past Monday the UPS package was delivered and that night I assembled the bike, it was 90% built but due to shipping the peddles, handle bars, seat and front tire and fender were not assembled. I took me 30 minutes and I was test driving my new bike. Now this was a huge thing because I had never tried one of these chainless bikes as they’re only sold online from Dynamic Bicycles. I ordered this bike on blind faith and it was worth it! The first thing you’ll notice about my bike is the design and colour make it look really slick. The fenders blend in with the black rims and metallic bronze frame. Once on the bike it’s just like any other rear hub bike, until you notice (or rather fail to notice) the lack of chain and derailleur noise. 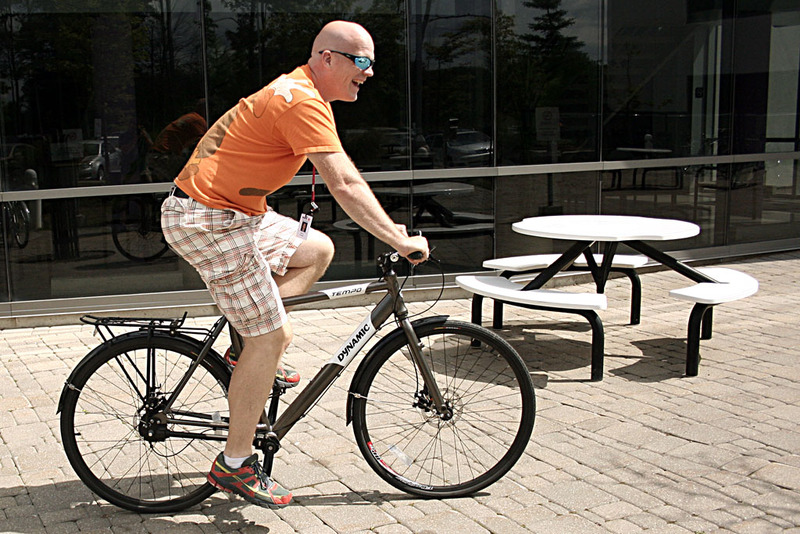 I had a co-worker take the bike for a test drive in the office and no one heard the bike go by. It’s a bike for ninjas! My first commute to work I was getting use to the rear 8 speed hub, changing gears without having to pedal is very foreign to me but by the time I got to work I had it down, just like using a clutch, take your foot off the gas when you change gears. At work I did a show and tell with my fellow co-workers, they were very impressed with the drive shaft design. I’m looking forward to my first winter with this bike and how it stands up to the KW weather and salty streets but with it’s closed design around all moving parts of the drive system, I’m sure to be a happy boy. I’ll keep you posted on how the bike does in the middle of snow storms and such. For now I’m just trying to get use to this new bike and learn how to maintain the drive system. As well I have never had disc brakes so that will be interesting as well. Once the weather gets colder I’ll need to put the winter tires (metal studded) on, this may be a challenge as the rear tire removal instructions are a little more complex then my derailleur type bike. In other words I will be doing follow up articles. Sweet, a shaft drive bike. I’ve always wanted one but could never rationalize the purchase in light of all the bikes I already have. Shaft-drives aren’t a new idea, check this 1899 Columbia out, it’s a nice restoration. I’d love to see more people choose shaft-drive over the silly carbon belts that are becoming popular, the shaft-drive seems better suited to low-maintainance urban riding than most anything else, really. I rode this bike when taking the pix. I was surprised how low the friction of the drive was. It was really efficient. Sure does seem like an interesting bike! When this past winter ended I spent about two days cleaning all the gunk, rust and other winter nasties off of my chain, derailleur etc. My only concerns with many newer style bikes are what some people complain about with newer cars…You need to take it to a mechanic in order to do any work on them as they’ve been made too difficult to work on yourself. That is so friggin cool. Wish I had done more research before buying my current bike! This would have been perfect for my all season choice. It’s winter time up your way now. How’s the Dynamic bike working out? I’m seriously thinking of buying of buying one but independent reviews on Dynamic bikes are sorely lacking.